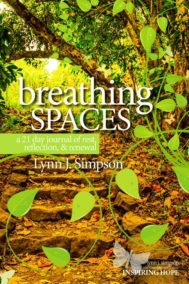 Lynn J Simpson understands the need for creating spaces and tools for rest, renewal, and transformation both personally and as a Certified Christian Life Coach. 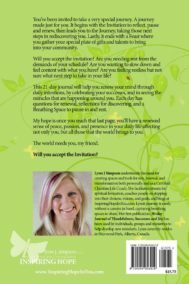 She facilitates retreats for spiritual formation, coaches people on stepping into their dreams, visions, and goals, and blogs at InspiringHopeInYou.com. Lynn’s journey is rarely without a camera in hand, capturing breathing spaces to share. 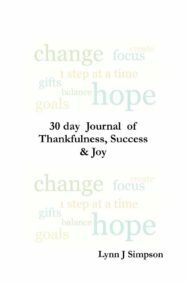 Her first publication, 30-day Journal of Thankfulness, Successes and Joy has been used by individuals, groups and ministries to help develop new mindsets. Lynn currently resides in Sherwood Park, Alberta, Canada. A 30-day journal to help you focus on the good in your life.